Spend a few nights under the stars. 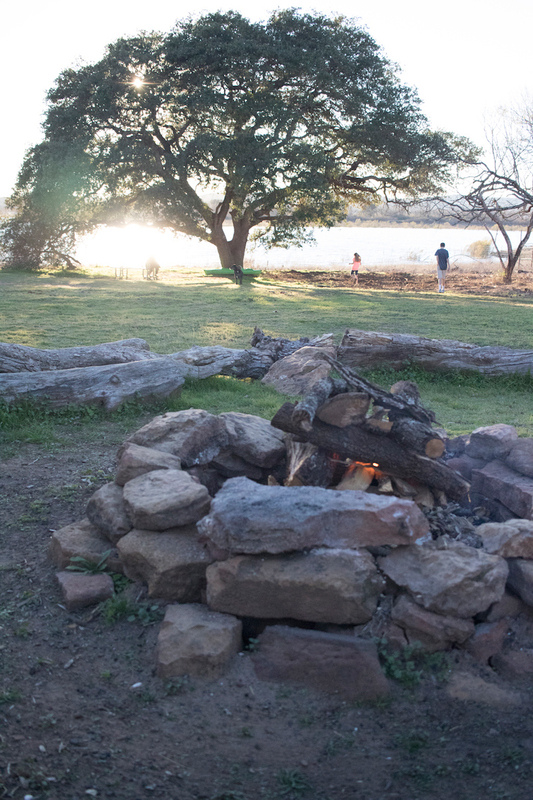 Whether you’re camping with others or going solo, make your Hill Country camping trip unforgettable with these five easy steps. First thing’s first: Know where to lay your head. 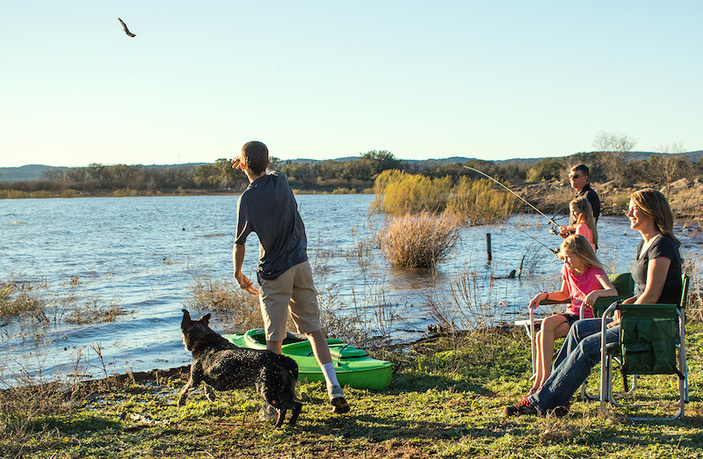 Whether you’re looking to catch the biggest fish, yearning for a cliff-jumping adventure, or planning a fabulous family cookout, read up on all of the area campgrounds to help decide which is right for you. 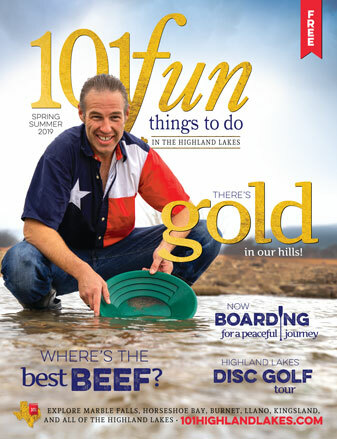 Consider camping at one of our favorite spots in the Highland Lakes. Colorado Bend State Park has campsites on a lush green field along the Colorado River that are perfect for picnics, swimming, and kayaking. The park is located south of the tiny town of Bend. Call (325) 628-3240. 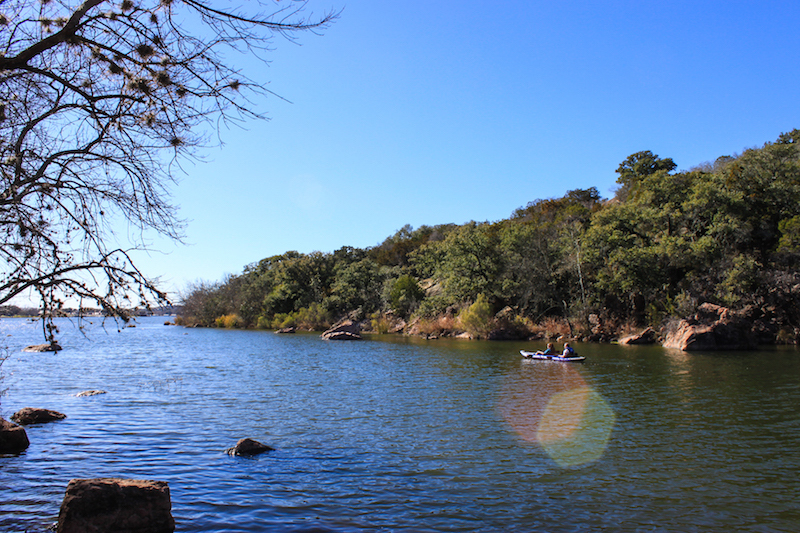 Inks Lake State Park features campsites along the rocky banks of Inks Lake — a favorite of anglers. Walk to Devil’s Waterhole for cliff jumping into pristine, cool waters. The park is located at 3630 Park Road 4 West between Marble Falls and Burnet. Call (512) 793-2223. Krause Springscampsites are nested in the middle of the Texas Hill Country. The swimming hole has a waterfall and a rope swing. The spring is located in Spicewood just off Texas 71. Visit krausesprings.net or call (830) 868-7304. Pedernales Falls State Park’s campsites offer the kind of scenic views that define the expanse and geography of Texas. A beach-like swimming area complements miles of hiking trails. The park is located at 2585 Park Road 6026 near Johnson City. Call (830) 868-7304. Canyon of the Eagles features premier campsites for RVs and luxury camping. 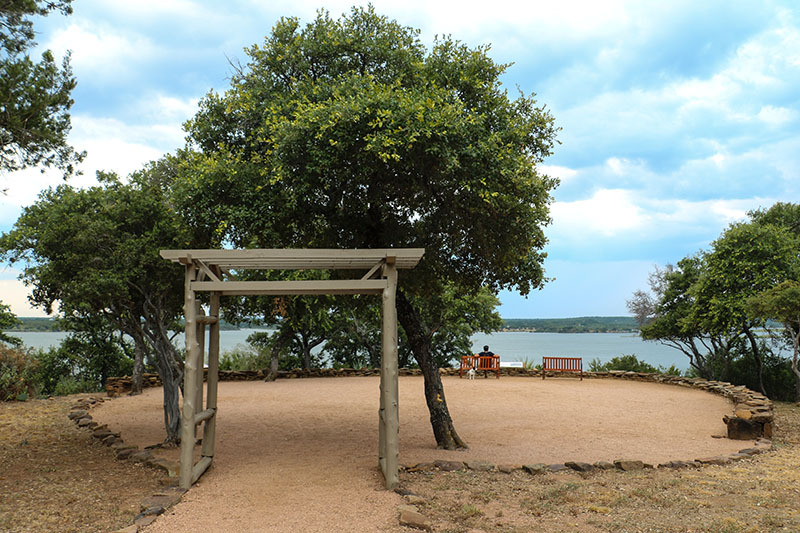 Along with incredible views of the Texas Hill Country, glampers will find Wi-Fi and running water. It’s located at 16942 RR 2341 in Burnet. Go to canyonoftheeagles.com or call (512) 334-2070. Big Chief RV and Cabin Resort has spacious campsites right on the water, free Wi-Fi, and a glimmering swimming pool and hot tub. There’s even a laundry room. Find the resort at 1420 FM 690 on the southeast side of Lake Buchanan. Go to bigchiefrvresort.com or call (512) 793-4746. Hidden Falls Adventure Parkis the spot for ATV and off-road enthusiasts with miles of rugged trails. Camp at a primitive site or stay in a bunkhouse. Located at 7030 RR 1431 East in Marble Falls. Go to hiddenfallsadventurepark.com or call (830) 798-9820. 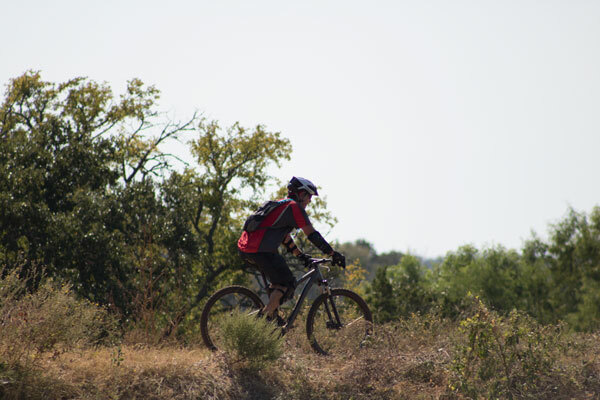 Reveille Peak Ranch has 1,300 acres of prime land for mountain biking, trail running, scuba diving, and more. Located at 105 CR 114 in Burnet. Go to rprtexas.com or call (512) 755-4417. With sketchy phone service and probably no Wi-fi, camping is the perfect time to unplug and play. Be prepared by packing outdoor favorites such as croquet, horseshoes, or washers. Grab a deck of cards to play the classics or specialty cards for Skip-Bo or Uno. Building a perfect campfire is all about how you stack the wood. For the perfect stack, you’ll need two types of wood: thick logs and thin branches for kindling. Tee-pee method: Build a “tee-pee” with the logs in a vertical circle, meeting at the top to form a cone. Log cabin method: Think Lincoln Logs. Stack your logs in a tight square. Stop when your cabin is three to four logs tall. Whichever method you use, stuff the kindling inside. Use wadded-up newspaper under that to start the kindling. Light the newspaper using a long lighter. If you’re impatient, pick up some fire starters from a supply store. Your campfire should burn beautifully. Adjust it as it burns using a long, sturdy stick. Most important: Put out your campfire completely at the end of the night by pouring water on it and maybe even shoveling some dirt on top of that. Don’t leave a single ember glowing. Try this quick and easy campfire recipe. After a long day exploring, your fellow campers will love this savory treat. Cut the jalapeños in half lengthwise and scrape out the spicy seeds (wear gloves). Fill the halves with cream cheese then coat the cream cheese with breadcrumbs. Tightly wrap each jalapeño with a slice of bacon and secure with a toothpick. Spread them on the grill and cook for 5 minutes on each side. I forget something every time I go camping, and it’s always important. Make a thorough list and check it several times. Camping essentials will vary, but these are the most necessary: bug spray, extra socks, and more water than you think you’ll need. It's not Hollingsworth Corner anymoremail for new or out of town people, it's the Spicewood General store. Good article and well written. Don't forget the TP.